Globe High School's Robotics Club, "TigeRobotics," has put significant work into building our robot to compete in this year's FIRST Robotics Competition (FRC) "Recycle Rush." We won the AZ West regional and now have the opportunity to compete at the Championship in St. Louis. Over the past year, the team has invested heavily in infrastructure, tools, parts and materials. Fortunately, most purchases will last for years and will help to ensure the continued and sustainable operation of TigeRobotics, Team 5059. Building our lab from scratch and attending the FRC championship likely makes this year the most demanding year for our budget. 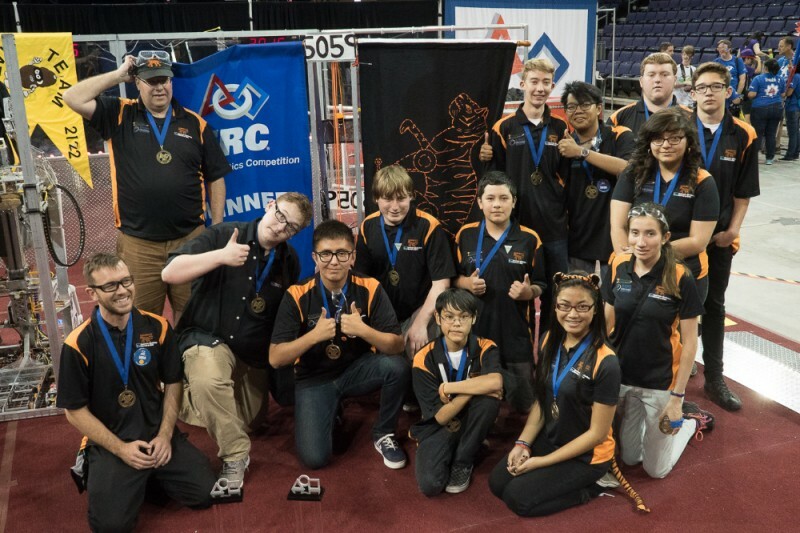 We are graciously asking for your help in supporting TigeRobotics' trip to St. Louis. We need to transport and lodge 12 students, one coach and three mentors. We hope to raise enough money for the flights as soon as possible so we can get our tickets before rates get out of hand. We're going to do our best to spend as little as possible. If we fail to raise enough to send the entire team, we'll unfortunately have to limit who can attend. If we raise above what is required, the excess will be used to support the team throughout this year and into next year’s competition. FIRST Robotics is actually less about robotics and more about empowerment, problem solving and personal development through real world application of STEM. Please donate, link and share! We have beat our target!!! The GHS Robotics Club has raised over $17,000 in 10 days! We need to send a massive thank you to Resolution Copper for their commitment to the team and their $4,000 donation towards our entry fee into the Championship. Their substantial financial support in the beginning of this competition season and now has permitted the success of Team 5059. Without their help we certainly would not have been able to make it to the Championship. Last night Team 5059 attended the City Council Meeting where we were recognized by the City Manager, Council and Mayor for our achievements. Beyond the crucial financial support, the club has received an outpouring of support like I've never seen before. Kind words and encouragement have definitely helped us carry on. To those who were not financially able to support the team but shared the info and expressed your support I'd like to send a sincere thank you. Your contributions are, perhaps more critical than you could imagine, to our continued success! It has Been a busy Few days! Here are some of the Direct donations we have received which will significantly drop the funding target! Thank you so much for the astounding amount of support! Your contributions are making a huge difference in the lives of these young men and women as well as Globe and surrounding communities. Last night we were able to finalize tickets and hotel reservations and I am very happy to report that the entire team will be attending! With that, now we have a much more accurate idea of what our costs are and we can revise our budget to a much more accurate target. We'll be teaming up with team 2486 the CocoNuts from Flagstaff for lunch which drastically drops the cost and complexity of meals at the event. Thank you CocoNuts! Our fundraiser at the Antique Show was a huge success! Thank you everyone who came out to support us. I'm happy to report the target has been dropped by $861 due to the generosity of all on the supporters this weekend who came out for a hot dog, many of whom generously donated beyond buying lunch. Fed Ex is Picking up the Robot this morning at the Bus Barn. The team is very grateful that the City of Globe was kind enough to do all of the crating for us. Especially the crew at the City Maintenance yard who has jumped through many hoops to get the robot crated on such short notice. Team 5059 would like to send a big thank you to the Rotary Club for their $1000 donation! Also a big thanks to all of the supporters who came out to the Antique show and supported the robotics cause. It was a great success! Thank you!